Independance Day while I had the chance. can be ordered through either QKR Stampede or Eureka! Stamps. These companies are sister companies along with Biblical Impressions. These balloons and holders are in both the QKR and Eureka! shops, along with a huge variety of other holders and balloons. I love working with these stamps! The images are versatile and interchangable. I stamped the Liberty Balloon Holder onto white card stock. Then I stamped another and fussy cut it to make a mask. I used removable adhesive to put it onto the card over the stamped image, then used water color crayons to color the sky and land. Once I removed the mask, I colored the Liberty Balloon Holder. The Firecracker Balloon was stamped onto white card stock and colored, then cut out and adhered to the card. I used a brown Zig pen to draw the string from the balloon. I think she turned out quite cute, what do you think? Leave me a comment and tell me what you are doing to celebrate Independance Day. Thanks for stopping by today, I hope you are having a wonderful day! And have a happy and safe 4th! Hello! Today I have a cute birthday card to show you. I made this with 2 images from QKR Stampede. I colored the "Love Bear" with FlexMarkers and added some Glossy Accents to the balloons. I distressed the edges of the papers and put this card together pretty quickly. This image can be used for a number of cards, birthday, get well, Valentine's day, just a simple hello. Thanks for stopping by today, leave a comment if you would and come again soon. And why not stop in to the QKR Stampede store and see what other versatile images they have to offer. Hi all, Kristie here today. Eureka! Stamps has so many beautiful angel stamps! I stamped the image onto white cardstock and colored her with FlexMarkers. I used the Cuttlebug to cut the image, the mat and the card. scored the one for the back at about 1/2" and adhered them at the top. The card opens at the scored fold at the top. 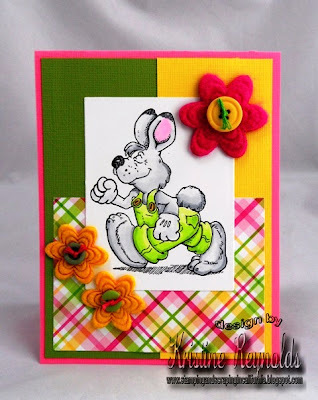 This is a very simple card to make and the image was fun to color. If you are an angel lover, hop on over to see all the beautiful angel images they have at Eureka! Stamps. they have tons of other wonderful images too. 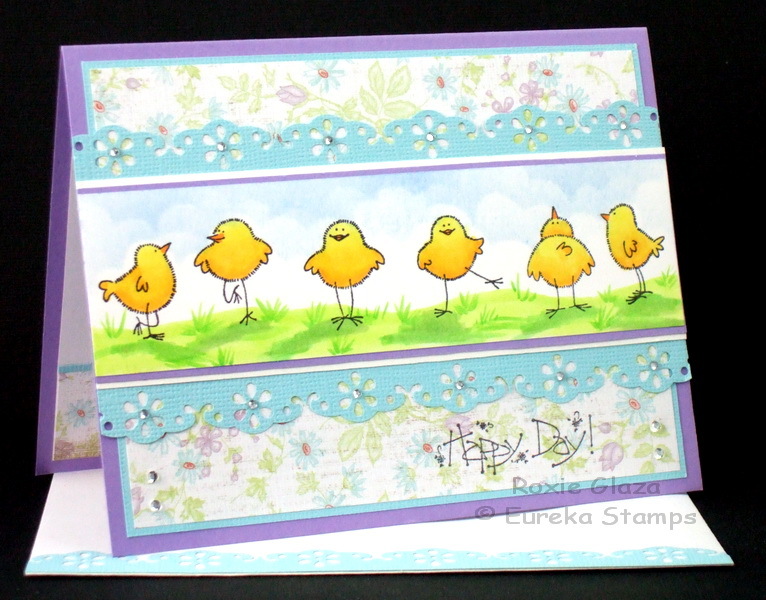 These cute chicks all come from the Eureka Stamps company and they are such fun to play with. The rubber images I used are listed below and if you prefer a larger image these can also be purchased as digital stamps. The clouds were created with a sponge and my hand cut template. If you’d like to cut your own template here’s a direct link to my blog post where you'll find the pattern. The decorative border was cut with the Martha Stewart’s Floral Lace border punch. The Perfect Layers tools from Perfect Paper Crafting was used to cut the borders. The gems attached to the punched out flower centers were attached using Glitter adhesive. Yes....we nearly made it through another work week! I am ready for the weekend! This Summery card puts me in the mood for a sunny, fun weekend! I used the "Out of the box technique" for this card. 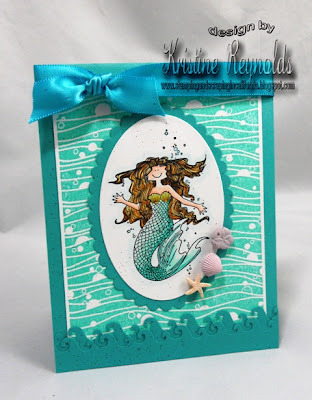 I did share this card last week on the QKR Blog but wanted to share it here too! I made this card a couple of months ago. I was going to use it for the Bunny Hop in April but ended up using a different card instead so I am pretty sure you haven't seen it! I just love this Racing Rabbit image by QKR Stampede. QKR has a ton of cute Bunny Stamps and lots of great sentiments to go with so make sure you go check them all out! This ostrich is so cute! It's a perfect image of a clueless person suddenly realizing they missed something! A larger ostrich can be found at Eureka, and if you prefer not to use google eyes, I recommend you go with this one; the eyes are a bit hard to discern in the smaller image, the lines are just a little to thick at that size (hurrah for small google eyes)! I used the oops text, but Eureka also has a "who ... me?" text or a "I forgot your bird day" that would be great as well. Today I have a pocket card to show you. I like making different styles of cards and I love this pocket card. It's simple to make. I used a piece of cardstock cut to 4 1/4" x 11" scored at 5 1/2" I also scored it at about 3 1/2" and folded that area forward to for the flap where the sentiment is. I did trim some of that flap off as I felt it was a bit too big for the card. 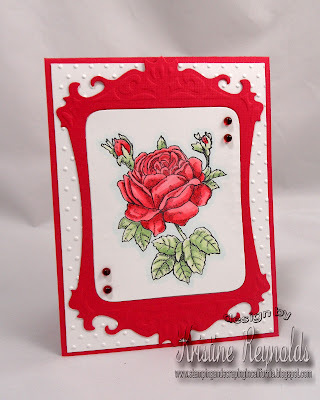 I used the "Rose" stamp in a couple ways. First I stamped the entire image onto the lower corner of the card with VersaMark ink. as well as the top of the pocket. I made a card to slip inside the pocket. I punched 2 circles, one slightly smaller than the other, layered them, folded them and adhered them to the top of the card. I added a little embellishment from my stash. You could easily add a flower or a brad like this, or punch a hole and add a bit of ribbon. I hope this card shows you that stamps can be very versatile, you just need to use your imagination. Use part of the stamp, use all of the stamp, use different kinds of ink for different effects and have fun. Leave a comment if you would and come again soon! Once again, I forgot until last minute that I needed a Father's Day card ... even though I gave my existing ones to my husband to choose from for his dad! I needed a really simple design, and somewhere in my searches for inspiration, I saw a card with leaves. My husband is not into sports, cards, hunting or golf, so a basic nature card seemed right. I had not yet used the gorgeous white wood-look cardstock, and was really pleased with how it looked. The brown behind the Father's Day text is the same pattern, it just did not show up in the photo. I love these skeleton leaves from Biblical Impressions! I usually emboss them, but for a masculine card, dye ink seemed a better choice! Happy Birthday Ya Old Goat! I thought this "Old Goat" was a pretty cute old guy, so I stamped him onto some white cardstock and colored him with my FlexMarkers. "Basket Weave" (#90407) from Biblical Impressions. brown Color Box Fluid Chalk Ink. I printed the inside sentiment on to green cardstock from my computer and layered it onto more kraft cardstock with the Basket Weave image. have made that feature some more of our humorous stamps. I also have another card posted on my blog that may give you a smile. So stop by and be sure to leave some love in the comment sections of the blogs. We always like to hear what you have to say. Thanks for stopping by and I hope to see you on our blogs! We are so excited about the next several months are going to bring -- new design teams, new products..... Help us spread the news!! Come to our facebook page (https://www.facebook.com/pages/QKR-Stampede-Cute-and-Quirky-Rubber-Stamps/214265492116) and click *share* to be entered in a drawing for $100 in FREE products!! Winner will be announced Thursday, June 21st. Product can be from Eureka Stamps (www.eurekastamps.com), QKR Stampede (www.qkrstampede.com), and Biblical Impressions (www.biblicalstamps.com). Contest open to everyone. Please note: if you hit *share* from a page other than our facebook page, we may miss adding you to the drawing. I love when elegance and simplicity come together in a card! The background is a darker beige than what you see here, and keeps the card from being too dark. The Romans 15:13 scripture was embossed in gold. The gorgeous, dimensional background is from a wallpaper sample book. Our local Sherwin Williams is always happy to pass these on to customers. I think someone has an "in" with one of the employees, because certain themes have always been gone when I get there, and I usually get there immediately after they say they remove the books from the shelves! Fortunately, the really elegant themes, and sometimes really amazing textured themes, are usually left. I have made journals as well with this particular pattern, and they've been the first to sell. I also have covered shoe boxes with wallpaper. It strengthens the box, as well as making it a decorative item, and one that easily wipes clean. Welcome to the Monthly Eureka Blog Hop! This month we are in a summery mood so the design team will be showing you some of the fabulous, fun summer images available from Eureka Stamps. Ceal out with a post of a card she created. Ceal isn't able to post right now, but she did make this adorable card for me to share with you. Isn't this little gal cute? to make this card and was inspired by the thought that summertime is just around the corner. I think she did a wonderful job coloring this cute little gal. What says summer more than picking dandelions? images you can find that conjure up summertime. I have a pretty card to share with you today that you could use for lots of different occasions! 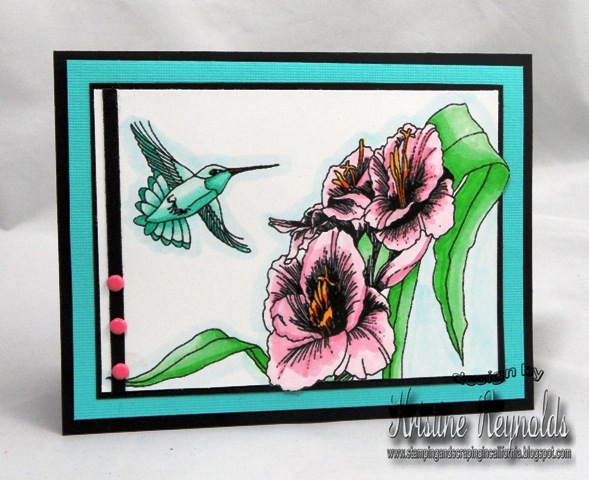 The image is Gladiola and Hummer from the Tender Thoughts line of Eureka Stamps. I colored it with Copic Markers and kept the design really simple because the image is large and I didn't want a fussy card to take away from it. I left the sentiment off of this one. I think it could be used with out a sentiment or you could add one for nearly any occasion. I hope you enjoyed today's card! Stop by again soon! I have a simple but striking card to share with you today. 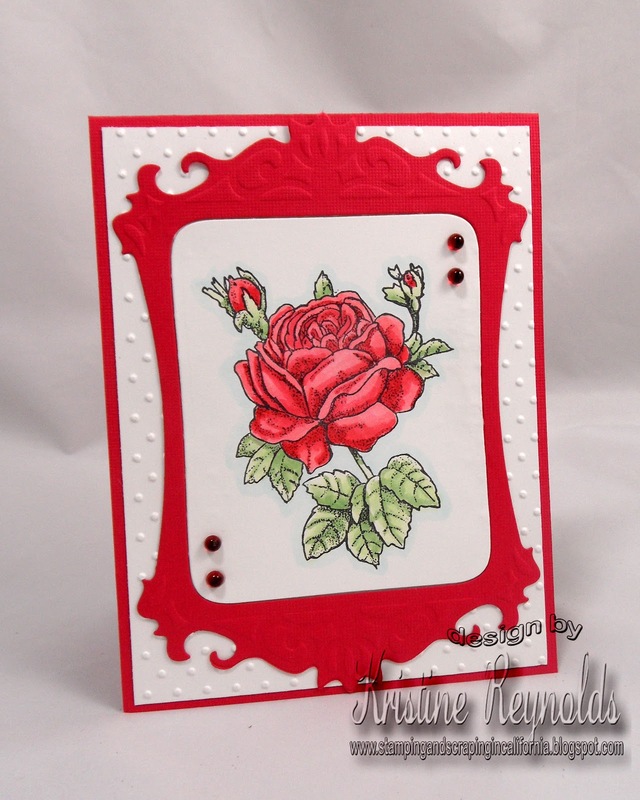 I made this card with Rose by QKR Stampede stamps. The image is available in red rubber and digital. The frame is a Spellbinders Die. I embossed the white panel with a Cuttlebug embossing folder. The Rose image is colored with Copic Markers. The Bling is Jelly Dots. I left the sentiment off so that the card could be used for almost any reason...birthday, sympathy, wedding...or just because! 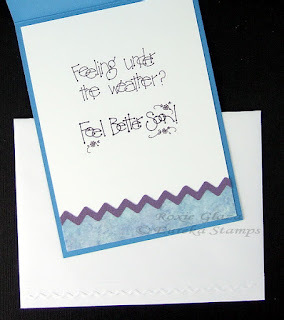 QKR Stampede stamps has any sentiment you might need! I thought this card was going to be extrememly difficult to make, especially having to cover up the original "L" at the beginning of Eureka's 1 Corinthians 13 verse so that I could use the (Garden Square) alphabet cube. I took a post-it pad and cut tiny strips to place over the L while inking. I colored the cube with pencils, and lightly chalked the background and the filagrees with a light yellow. After stamping the L in black with versafine ink which is gives nice dark coverage, it still seemed a little light, so I added on a little black embossing powder. By the time I did so, the ink was partly dry, but it still did the job. All images (besides the verse) are located on this same page. The whole alphabet is present, as well as several other cubes. I am looking for a TWO groups of stampers for my new Design Teams -- one group to work with Eureka Stamps (www.eurekastamps.com) and one group to work with QKR Stampede (www.qkrstampede.com). Projects posted with social media such as: your personal Facebook page, your personal blog, Pinterest, and at least one online gallery, etc. Along with projects posted on the company blog including writing your own posts. Ability to participate in a 6 month term starting July 1st through December 31st. Design Team call is open to everyone (not just US residents). DT members will be sent DIGITAL stamps of their choice in order to fulfill monthly requirements. At the end of the term, members may request their digi-stamps to be replaced with RED RUBBER stamps. I also need two ladies to lead each team. Unfortunately life right now has me too busy to do this myself (my mom and daughter seem to be alternating hospital stays). So, each lady must be a good leader and feel comfortable making decisions without me if needed. If you’re interested in being a part of the team send an email with a link to your blog to maribeth@qkrstampede.com. Yes, I know it's June and Christmas isn't for several months, but it's always good to think ahead. If you are someone who makes their Christmas cards, it's never too early to start. Now that being said, it doesn't necessarily mean that I will keep working on mine. LOL! But I'm going to try to get at least some of them done early. I was inspired to start some Christmas cards when I stamped this angel not realizing that it was a Christmas Angel until I had her stamped. "Large Christmas Angel" (#7504) is from Eureka! Stamps. I stamped her onto white cardstock and colored her with FlexMarkers. I also added a bit of Distress Stickles to the trim of her coat. This is a large image, so all it needs is a bit of layering of colored cardstock and it was done. I do think she is rather pretty. Thanks for stopping by. Leave a comment if you would and let us know if you are starting on your Christmas cards early this year. Stop in to the Eureka! Stamps site and see what you find for some lovely and unique cards. Be sure to stop again soon and see what the design team has to show you. As I mentioned in my last post for Biblical Impressions, I have two more designs made from the suncatcher images. I love doodling geometric designs,so despite not being into suncatchers (Native American religious symbols), I find the design wonderful for playing with. The first thing I made with the 16 pt. suncatcher image was this flower. If you look at the original image, you can see where I cut for the petals, and where I cut for the leaves. You'll need to emboss it four times to come up with enough to cut from. Each petal layer is a single piece (2 total), though certainly you could cut out individual petals (though you'd need additional embossed images)for a more layered and perhaps more elegant look. I placed the thank you on white mulberry paper just because the card "needed" something. The idea of making a butterfly is what motivated me to order the 8 pt. suncatcher. It certainly could be made with just one pattern, but I liked the idea of using the more angled image for the lower wings. I thought I would just create my own butterfly body, but I really am hopeless when it comes to forming shapes with pencil or scissors, so I simply used the body from Eureka's 3-D butterfly pattern. It's a little short, but the best I could do! The Proverbs 3:5,6 image is a bookmark stamp; Biblical Impressions carries a number of scriptures in this great style. 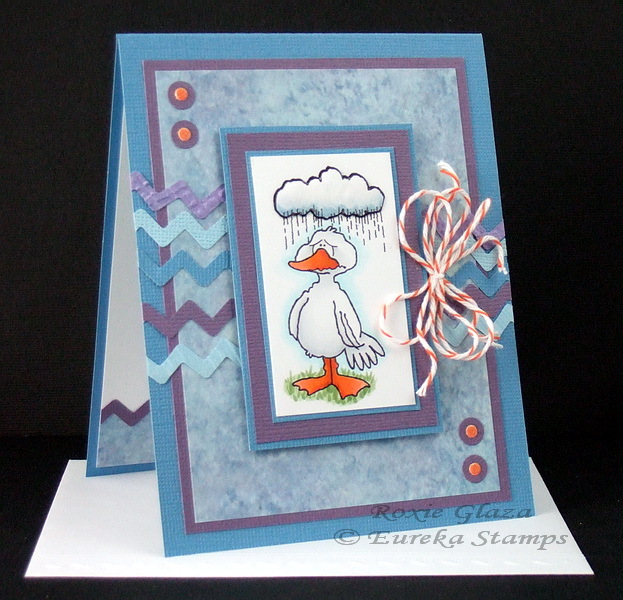 The duck is a digital image from Eureka Stamps. I printed the entire image then cropped the image to get just the cloud and printed it a second time so I could pop it up on the image. I used a couple layers of thick carpet tape to pop it up. The EK Success Zig Zag border punch was used to cut the rick rack and it’s glued to the card with Aleene’s tacky glue which I also used to attach the brads cut with the Cuttlebug using the Tiny Tags dies and brad mats using a QuicKutz die. The insert is printed with two separate images from Eureka which are listed below.